Capable of providing full power protection for large homes and the most demanding power needs. INNOVATIVE DESIGN & PROTOTYPE TESTING: are key components of GENERAC’s success in “IMPROVING POWER BY DESIGN.” But it doesn’t stop there. 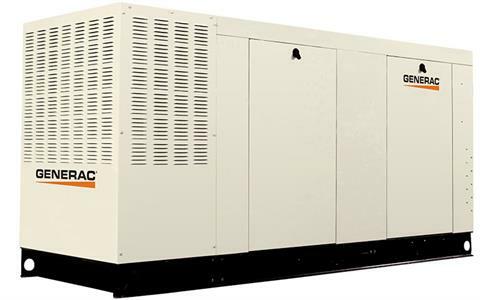 Total commitment to component testing, reliability testing, environmental testing, destructing and life testing, plus testing to applicable CSA, NEMA, EGSA, and other standards, allows you to choose GENERAC POWER SYSTEMS with the confidence that these systems will provide superior performance. SOLID-STATE, FREQUENCY COMEPENSATED VOLTAGE REGULATION: This state-of-the-art power maximizing regulation system is standard on all Generac models. It provides optimized FAST RESPONSE to changing load conditions and MAXIMUM MOTOR STARTING CAPABILITY by electronically torque-matching the surge loads to the engine. Digital voltage regulation + / - 1%. GENERAC TRANSFER SWITCHES: Long life and reliability are synonymous with GENERAC POWER SYSTEMS. One reason for this confidence is that the GENERAC product line includes its own transfer systems and controls for total system compatibility. Liquid Propane - Half Load 287 cu. ft. / hr. Liquid Propane - Full Load 507 cu. ft. / hr. Natural Gas - Half Load 713 cu. ft. / hr. Natural Gas - Full Load 1260 cu. ft. / hr. 72 dB @ 23 ft. (7 m) operating at normal load.